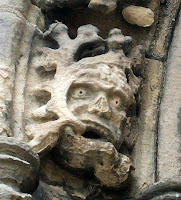 I've long been fascinated by the image of the Green Man - a head surrounded by leaves and often with foliage emerging from the mouth. 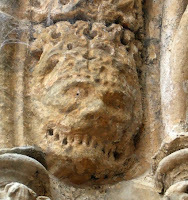 He seems like a spirit of nature or a Pagan god of all things growing, yet he appears most often in Medieval churches. 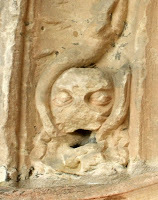 There are more than 100 Green Men in Rosslyn Chapel, which I visited while on holiday in Scotland last week. The Green Man's origins are a puzzle. 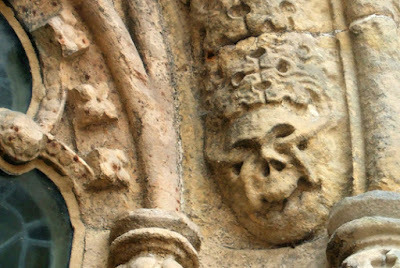 You can find the face of the Green Man in many churches in the UK, including Salisbury Cathedral as well as Rosslyn Chapel. Why were Christians so keen on a symbol that doesn't seem to have much to do with Christianity? Sure, Medieval churches also have plenty of carvings of ordinary people going about their daily lives. 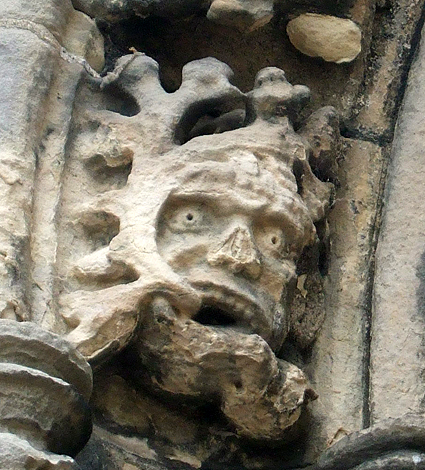 They also have gargoyles and grotesques of demonic creatures. But the Green Man is neither of these. Historically, the green man symbolised the capacity for great goodness and the parallel scope for significant evil. The vines or foliage sprouting from the mouth are said to represent nature’s growth and fertility. Maybe that is the only explanation, but I'm not so sure. Apparently the name ‘Green Man’ was coined by Lady Raglan when she wrote an article for the journal Folklore in 1939. Prior to that they had just been called ‘foliate heads’. Sometimes there were leaves on or around their faces, but not actually coming from their mouths. It isn't certain whether all the foliate heads are intended as depictions of exactly the same thing or are simply similar. 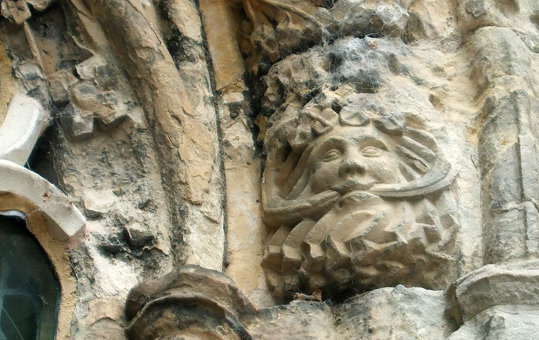 Roman architecture sometimes features ornate leaf masks, which are usually taken as showing the close interdependence between man and nature, and as describing the deities of Pan, Bacchus, Dionysus or Silvanus, and the mystery religions that grew up around them. A leaf-clad statue of Dionysus in Naples, Italy, dating back to about 420 BCE, is often considered one of the first Green Men images. I'm more than happy to honour Dionysus, but are our Green Men some sort of continuation of that or is the similarity just a coincidence? After all, Jack-in-the-Green looks like a Green Man, but is actually unconnected historically. Nevertheless, there are quite a few pubs called The Green Man, so maybe there's something in that to show a continuing - if unintentional - reverence for the deity of inebriation. I have read and heard many theories. One theory suggests an unbroken line of worship of the Green Osiris in Ancient Egypt, with pagans secretly putting the face of their god in Christian buildings. 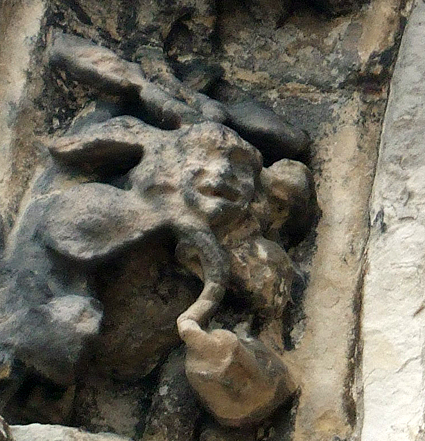 Another suggests sightings of Bigfoot inspired various stone-carvers over the centuries. Some people just think that nature will always return to inspire us and that you simply can't keep a good Green Man down. Personally, I just don't know. 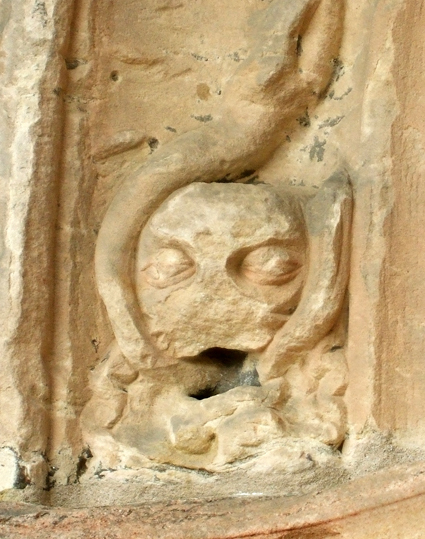 Whenever I visit churches, I search for Green Men - perhaps hoping to find some clue as to their real meaning by seeing as many of them as a can. When I went to Rosslyn Chapel I asked one of the tour guides to point some out to me. The finest example is inside, in the Lady Chapel, but tourists aren't allowed to take photos there. There is, however, a whole series of them on the edges of the window arches outside. They seem to show the entire cycle of human life - from a Green Baby to an adult, an old person, a Green Death's Head and finally a Green Skull. On this page you can see some of the photos I took. What do you think is the origin of the Green Man? Do you think it is simply a recurring theme that has independently come to different artists at different times or do you believe there is more to it than that? Do leave a comment. Did you look for the Grail while there ? . I did think about it :) There are definitely areas in the chapel that have a very strong energy. I saw a tv programe some time ago, they were making a case for the Knight's Templer finding the Grail and hiding it there.